Are You Ready for Your Next Service Tech Hire? One of the most pressing challenges facing our industry is finding good field service technicians. When it all comes together and you find that perfect technician, they complete their training and then finish the on-boarding process, you are ready to begin servicing your customers. If you don’t have a truck to immediately put them in, you are losing money. Auto Crane Dealers are ready to support you! Participating Auto Crane Dealers have invested heavily into building Work Ready Mechanic’s trucks to help support your business. 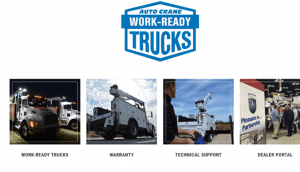 Workreadytruck.net gives you the ability to find trucks that are available now as well as specifications and completion dates of the trucks we are building. We are ready for your next hire!